Plot: A beautiful girl grows up as the servant to her wicked step-mother, but she finds love with the Prince. If you have a tween or younger girl in your house you simply must take them to see this movie. They will LOVE it. 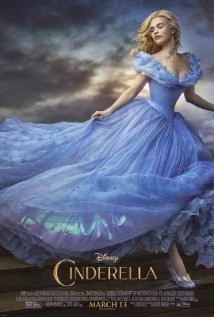 CINDERELLA is a beautifully told tale that doesn't feel like a rehash of the dozens of other movies by the same name that have popped up through the decades. One nice aspect about this new Cinderella is that she is much more than just a pretty, nice girl that can only escape her pitiful situation by finding the love of a man. In fact, the first time she meets the prince the outcome is quite unexpected. Cate Blanchett does a stellar job as the wicked stepmother, and even though we are still very early in the year, we may see her get some award nominations as 2015 comes to a close. The step sisters are riotously funny and Helena Bonham Carter is perfect as The Fairy Godmother. My only issue with this film is that the first half hour is really sad and slow. After that the story picks up and we are all on a ride into a wonderful ever after. By the way, it's worth the price of admission just to see the Disney animated short FROZEN FEVER that plays prior to the film. It's seven minutes of pee-your-pants funny. Plot: Two life-long friends and gangsters go after each other after one has to kill the son of the other one in order to save his own son's life. I've said before that Liam Neeson has really found his niche making action films where he's a quasi-bad guy with a conscience and is trying to make things right. That said, maybe he shouldn't take the lead role in every single movie that comes out with that plot line. While this movie does have an incredible cast, all of which do great work in making their characters feel authentic, they don't have a lot to work with in this basic story. And while the story is fairly entertaining, it isn't nearly as compelling as it could be, nor do we see the character depth in some of the principle players that would make us want to care more about the outcome. There are several large plot holes and many moments of convenience throughout the film that will probably drive you crazy. For example, can anyone explain to me how two injured and tired guys can be in a small building surrounded by 50 cops and still manage to sneak out the back door? It's moments like that that make this a film that could have been great into one that is mediocre at best. 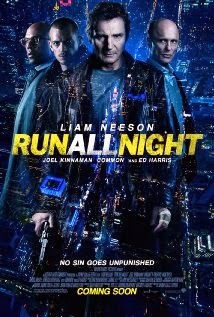 I can't comment on how Neeson's other badass characters come across, but in Run All Night he is downright filthy.